It was set to be a late night for the folks at Hush when we visited last year on Devil’s Night; already a line snaked through the entire parking lot. John and I soaked in the impressive scene, a little more than two years prior nobody had even heard the name Hush — this crowd was a testament to the prowess of the team behind one of Detroit’s hottest haunts. The decrepit facade of the Hush Corporation loomed in front of us ensnared by wild vegetation and marred by the fallout of some terrible event. What had befallen the once proud and polished institution? Had the risk of the experiments conducted within run afoul? Did unchecked hubris doom the organization to failure and ruin? And what had become of the iconic and inimitable Dr. Phineas Phun?! As John and I waited in line we watched as a clawed hand pawed through the boarded windows — there was no telling what kind of creatures were alive inside just yet, but soon we would join them inside the defunct Hush Corporation. As soon as we were admitted, a devilish character with a raspy voice welcomed us inside, he was flanked by a beastly henchman. The duo seemed to revel in the fall of Hush and were eager to see human flesh walk so willingly into its clutches, yes, the monsters had risen and now ruled the roost. Nearby, we encountered the same odd receptionist from a year ago. Readers may remember that she exuded a cold, cyborg-like cadence and personality and indeed that remained but something had changed. She had once seemed eerie but now there was a decidedly dark quality in her robotic words. When we inquired about the whereabouts of Dr. Phun her necked suddenly twitched and she replied with icy authority, “Dr. Phun is dead.” As depraved and twisted as Dr. Phun was, if he was dead, then there was no one left to keep a lid on the madness at the Hush Corporation. We navigated the familiar halls but found them scarcely populated by the staff that was once employed here, instead we dodged a girl who had been infected with some unknown disease, were surprised by a pint-sized animatronic pygmy and startled by a dinosaur who forced its head through a whole in the wall. No sooner were we clear of the rampaging reptile when we were confronted by a twitchy girl and her teddy bear that she referred to as Mr. Cuddles. Once past her and the dubious Mr. Cuddles, we entered a laboratory where we had one year prior been stalked by a deranged doctor and reanimated corpse. That duo was nowhere to be found but we were immediately accosted by an elderly lab technician with a nasally voice who excitedly explained his recent experiments, one of which included his own son who was being held captive inside of a Plexiglas cell. Sonny Boy wore a rictus grin and pounded his fists angrily against the walls that held him. He laughed uncontrollably at seemingly nothing and was by all accounts, certifiably insane. After taunting him for several moments we were duped into entering the structure ourselves and forced to spend a little time with this less than prodigal son before escaping through a passage near the rear of the cell. Soon, we emerged into the crisp night air but Hush had no plans to let us off that easily. We began to worm our way through a labyrinth of narrow passages that were packed to the gills with all manner of miscreant. A blasphemous priest assailed us with torn pages from what he called the Unholy Bible, indeed he was a horrific site to behold but he wasn’t alone. A physically imposing, snarling nihilist fervently pursued us spewing graphic rhetoric on the meaninglessness of life itself. The forceful duo struck a deeper, disturbing cord and in doing so proved to be a cut above the rest. Around another corner, someone threatened to stuff us into a box with their pet zombie. Elsewhere some creep claimed to have eaten Dr. Phun and then insisted that John was the late doctor’s twin and should suffer a similar fate. Fortunately, a former staff member intervened and began to lead us to safety but she was soon snatched up by a cryogenic freak! The noise had risen to a deafening din — a chainsaw rattled somewhere nearby, a dense fog obscured our view. A wild girl had leaped a top a shipping container to our left and beat it with a stick, the laugh of a lunatic could be heard reverberating through the air. Suddenly we were just two bodies in a sea of humanity as others scrambled to escape the mad scene. The chainsaw and laughter grew in volume and soon we saw a man in a gown holding a bed pan. He flicked the contents of the pan at all who passed, giggled like a school girl as he did and insisted that everybody share in what he delightfully called pea soup…or perhaps it was pee soup. Probably pee soup. Yeah, definitely pee soup. 2015 was to be the final year for Hush at the Ford Road location but a series of roadblocks prevented the team from moving ahead with its plans for a thrill park near Skateland West. No need to fret, the show must go on! Hush Haunted House will return to 34043 Ford Road in Westland with a completely rebuilt and expanded show for 2016. 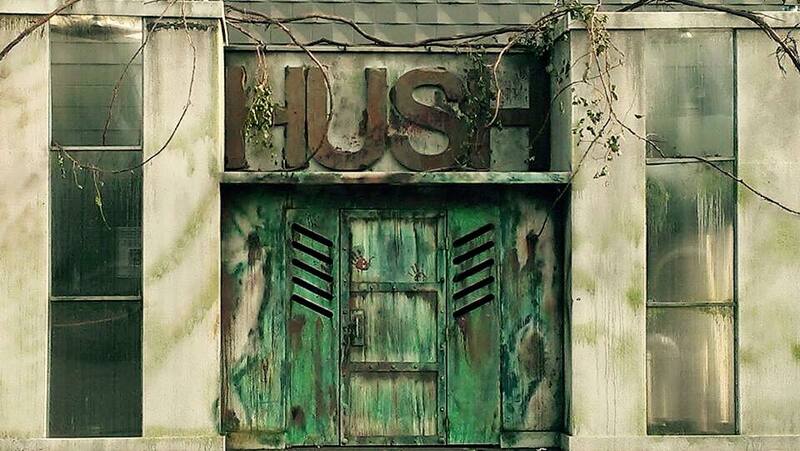 It would seem that the Hush Corporation has regrouped and erected a wall around the town of Hush Falls, a reportedly New Orleans inspired setting. Color me intrigued.